Indonesia’s Lion Air Group is aiming to launch a new affiliate in Thailand by the end of 2013 with an initial fleet of two 737-900ERs based at Bangkok Don Mueang Airport. The new carrier, Thai Lion, will follow the low-cost model and, unlike Lion’s Malaysian subsidiary Malindo, provide an all-economy no-frill service. Thai Lion will initially serve two international routes – Kuala Lumpur and Jakarta – and Thailand’s second largest domestic route, Bangkok-Chiang Mai. With Kuala Lumpur and Jakarta, Thai Lion will be able to leverage the hubs of its sister carriers. The new carrier will compete primarily against Thailand’s two existing LCCs, Thai AirAsia and Thai Airways' low-cost affiliate Nok Air. Both are based at Don Mueang and serve Chiang Mai while AirAsia is the market leader between Bangkok and Kuala Lumpur and also serves Bangkok-Jakarta. Thai Lion is currently in the process of being certified by Thai authorities. The carrier has been allocated two of the six 737-900ERs the Lion Air Group is slated to receive in 4Q2013. Thai Lion aims to begin revenue flights by the end of the year, pending regulatory approval. Lion is expected to own 49% of the new carrier, following the ownership structure at Malindo, which launched services in Mar-2013 with a majority 51% stake held by Malaysian company NADI. Lion has not yet disclosed its partner in Thailand. The partner has only been privately identified in applications with Thai authorities and will be formally revealed if the carrier succeeds at securing an air operator's certificate. Lion sees room in the Thai market for a third LCC. In Malaysia, the group decided against following the LCC model although the market only has one local LCC, AirAsia. In Thailand the market is more fragmented and the LCC penetration rate is currently much smaller, providing a potential opportunity for Lion to come in with a low-cost product. The system-wide LCC penetration rate in Thailand is currently 29%, the lowest among the five largest Southeast Asian markets. AirAsia is the LCC leader in Thailand but accounts for only about 15% of total seat capacity, or approximately one-third the share it enjoys in Malaysia. AirAsia currently accounts for about 52% of Thailand’s LCC capacity, including 43% for Thai AirAsia, while Nok Air accounts for about 25%. Unlike Malaysia, Thailand also already has a second local full-service carrier in Bangkok Airways. Bangkok Airways, which operates domestic and regional international routes and focuses on feeding foreign full-service carriers, currently accounts for about 6% of total seat capacity in Thailand. Thai Airways, including its regional hybrid carrier Thai Smile, has a leading 29% share. Thai Smile, which has taken over several thinner domestic and regional international routes from Thai Airways since launching in mid-2012, is not generally considered a LCC. Although it has a lower cost base than Thai Airways it offers a business class, albeit relatively basic, and provides snacks and refreshments in both classes. Bangkok Airways provides meals and refreshments and offers a business class on select flights. Thai Lion will have the same aircraft interior and a similar product to the main Lion brand, which operates predominately in the Indonesian domestic market. Like Lion, Thai Lion will operate 737-900ERs in single-class configuration with 213 seats. Lion sells beverages and snacks but is not nearly as aggressive as AirAsia with pushing on-board sales. Unlike most LCCs, the Lion (and Thai Lion) product includes complimentary checked baggage. Malindo enjoys a low cost base, leveraging its relationship with Lion, but offers a full service in both classes. It operates its 737-900ERs in two-class configuration with 12 business class and 168 economy class seats. There are in-flight entertainment monitors at every seat in both cabins along with complimentary meals and drinks. Malindo has the same interior and a similar product to Batik Air, Lion’s new full-service subsidiary in Indonesia. Malindo also operates ATR 72s on short domestic routes within peninsular Malaysia. These aircraft are in the same single-class configuration as Lion regional budget subsidiary Wings Air but Malindo, unlike Wings, provides refreshments on its turboprop flights. Lion has not yet disclosed whether turboprops are part of the business plan for Thai Lion. But given the network model followed by all of the group’s carriers, ATR 72s will likely eventually be used by Thai Lion to operate thinner and shorter routes. Turboprops open up a wider range of potential destinations in Thailand and would give Thai Lion an opportunity to provide a key differentiator to Thai AirAsia. Nok has been successful at using turboprops, including ATR 72s and smaller wet-leased Saab 340s, to open new routes and become Thailand’s largest domestic carrier. AirAsia follows a stricter model with a single aircraft type. While Thai AirAsia is by far the biggest international LCC in Thailand, Nok currently has about a 27% share of domestic capacity compared to 26% for Thai AirAsia. On domestic trunk routes AirAsia generally has a bigger share of the market than Nok while Nok’s ability to operate smaller routes gives it a much larger overall domestic network. Nok currently serves 22 domestic destinations and only one international destination, which it launched on 1-Sep-2013. Thai AirAsia currently serves 13 domestic destinations and 19 international destinations. Thai Lion will start with one domestic and two international routes, giving it initially a network strategy more similar to Thai AirAsia. But if Thai Lion follows the normal Lion Group strategy and adds ATR 72s, it could eventually end up with a domestic network that more closely rivals Nok. Mr Kirana has confirmed that Thai Lion’s initial destinations include Chiang Mai, Bangkok and Jakarta. Bangkok-Chiang Mai is currently the second largest domestic city pair in Thailand after Bangkok-Phuket. 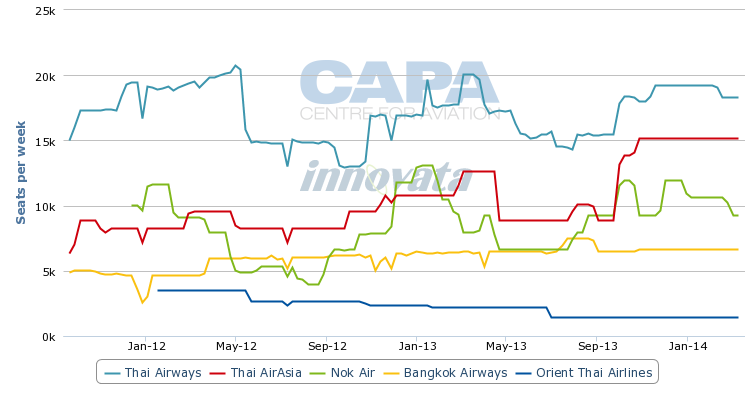 According to Innovata and CAPA data, there will be over 100,000 weekly return seats between Bangkok and Chiang Mai in Oct-2013. Nok will operate nine daily flights between Don Mueang and Chiang Mai in Oct-2013 while Thai AirAsia will operate 11 daily flights on the Don Mueang-Chiang Mai route, increasing to 12 by the end of the month. Over the last year Thai AirAsia has introduced additional flights to Chiang Mai on several occasions although it has also made some temporary seasonal reductions during off-peak periods. On a year-over-year basis AirAsia’s capacity in the Bangkok-Chiang Mai market has increased by 58% as the carrier only operated 53 weekly Bangkok-Chiang Mai flights in Oct-2012. From Suvarnabhumi, Thai Airways is offering nine daily flights to Chiang Mai in Oct-2013 including seven widebody frequencies. One of the two narrowbody frequencies is operated by Thai Smile. Bangkok Airways will operate five daily flights on the Suvarnabhumi-Chiang Mai route using A319/A320s. 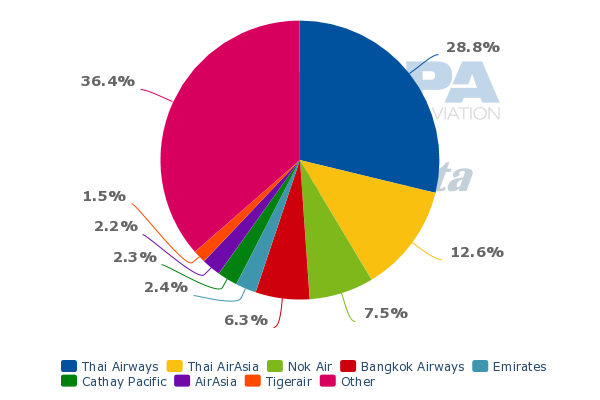 Based on the schedules for the first three weeks of Oct-2013, Thai Airways will have a leading 35% share of capacity in the overall Bangkok-Chiang Mai market while Bangkok Airways will account for 13%. LCCs will have a 53% share, including 27% for Thai AirAsia, 23% for Nok and 3% for Orient Thai. Orient Thai is a very minor player and follows more a leisure carrier rather than LCC model. Thailand is generally considered to have had only two local LCCs since One-Two-Go, which was an Orient Thai subsidiary that followed a pure LCC model, ceased operations in 2008. Orient Thai has since steadily reduced domestic capacity and currently only serves two domestic routes, Don Mueang to Chiang Mai and Phuket, with just one daily flight and a second frequency on weekends. Orient Thai’s small remaining domestic operation could be the most vulnerable as Thai Lion becomes the third major LCC in the market. Vietnamese LCC VietJet and tiny Thai regional carrier Kan Air are also planning to launch a joint venture LCC in 2014, Thai VietJet, which would also compete in the domestic market. While there are opportunities for more LCC capacity given the huge size of the market, routes such as Bangkok-Chiang Mai could see over-capacity, particularly during off-peak periods. Demand on most of Thailand’s domestic trunk routes fluctuates significantly depending on the season. There is also higher demand on weekends. International routes between Bangkok and other Asian destinations generally have less seasonal variation. Kuala Lumpur is currently the third largest international market from Bangkok after Hong Kong and Singapore. It is the second largest international LCC market from Bangkok after Singapore. AirAsia currently accounts for a powerful 45% of seat capacity between Bangkok and Kuala Lumpur. AirAsia’s Malaysian subsidiary and Thai AirAsia combined currently operate 11 daily flights from Don Mueang to Kuala Lumpur International. Malaysia Airlines and Thai Airways each account for about a 19% share of capacity in the market and operate from Suvarnabhumi. 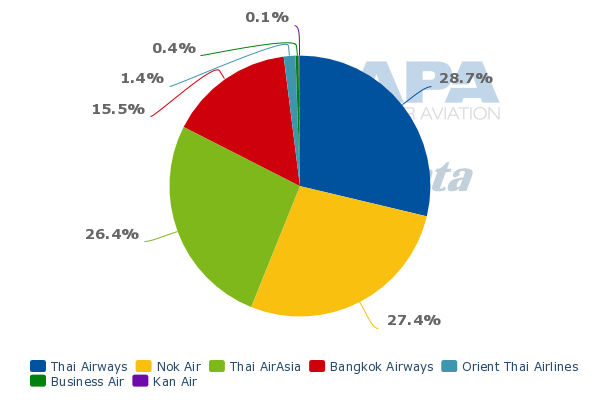 Several non-Asian carriers which operate Suvarnabhumi-Kuala Lumpur tags with pick-up rights account for the remaining 17%. 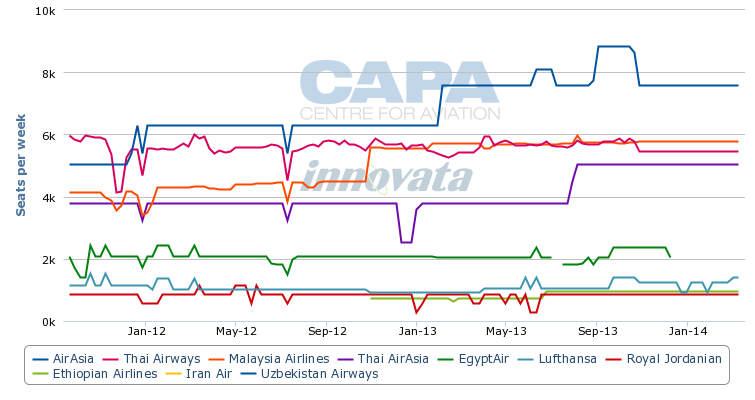 While Bangkok-Kuala Lumpur already has a significant LCC penetration rate, the market could benefit from new LCC competition. Thai Lion is expected to initially operate two daily flights on the route, which would give it about a 9% share of the market. Thai Lion should be able to make the route work by coming in at a potentially lower fare than AirAsia and leveraging connection opportunities with Malindo. Thai Lion will benefit from being the only Lion Group carrier operating between Bangkok and Kuala Lumpur. Malindo has no intentions of serving Thailand as it is currently focusing its own international expansion on Indonesia and South Asia, with North Asia services to begin in 2014. The Lion Group sees Thai Lion’s product as better suited for the Thailand-Malaysia market as it is a short flight, about two hours, and primarily consists of leisure passengers. While the group could have used Lion Air to enter the Bangkok-Jakarta market, Lion Air is focusing on domestic expansion opportunities in Indonesia. Giving the route to Thai Lion should help the new carrier during its initial phase as it can leverage Lion’s strong brand in Indonesia and portfolio of slots at congested Jakarta Soekarno-Hatta. Thai Lion will also be able to tap into Lion’s strong domestic network at Jakarta, where Bangkok passenger will be able to connect to a wide range of destinations. Thai Lion will share the same booking engine as Lion, Malindo, Batik and Wings Air and will interline with all sister carriers, providing through check-in to the final destination. The Bangkok-Jakarta market is relatively under-served given that Bangkok and Jakarta are the two largest cities in Southeast Asia. There are currently only eight daily flights in the market, including three from Garuda Indonesia, two from Indonesia AirAsia, two from Tigerair Mandala and one from Thai Airways. 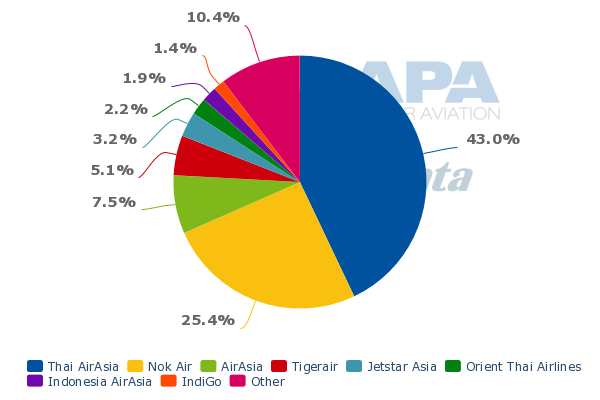 Garuda Indonesia is the market leader with 31% share of seat capacity while Thai Airways, which is the only carrier on the route operating widebodies, has a 20% share. 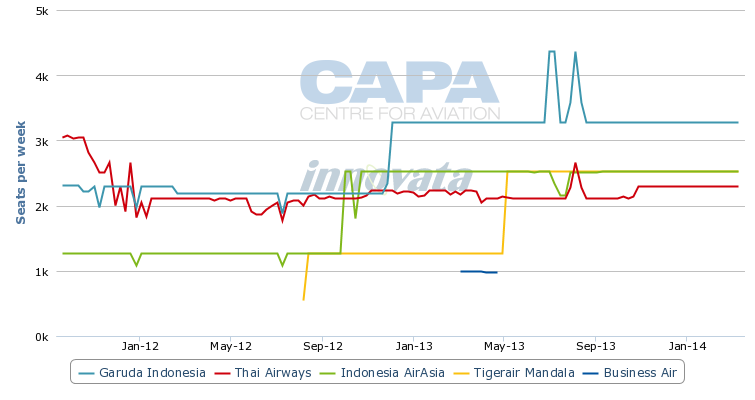 Indonesia AirAsia and Tigerair Mandala each have a 24% share, giving LCCs a 48% penetration rate. AirAsia is currently the only carrier currently serving Jakarta from Don Mueang. The success Tigerair Mandala has had on the Bangkok Suvarnabhumi route shows the market remains relatively under-served and could potentially support a third LCC. Bangkok was Mandala’s third international destination after re-launching services with support from Tigerair in 2012 and less than one year later Mandala doubled capacity on the route by adding a second daily frequency. With an expected two daily flights, Thai Lion will quickly capture a 22% share of the Bangkok-Jakarta market. As the flight is just over three hours in duration, two daily return flights will require the equivalent of one aircraft – a lot of capacity for a new carrier but justified given Jakarta is the group’s home base. Mr Kirana expects Bangkok-Jakarta to be Thai Lion’s longest route. The carrier will focus on routes of three hours or less, as is the case with Lion Air. Malindo and Batik are being positioned as the group’s subsidiaries for longer routes as they provide a full-service product which the group believes passengers prefer for flights over about three hours. Malindo, for example, is planning to serve several medium-haul destinations in South Asia, which Thai Lion will be able to access by offering connections via Kuala Lumpur. Mr Kirana sees the group potentially placing 70 to 80 aircraft from its huge 500-plus aircraft order book at Thai Lion but whether the carrier ends up with such a large fleet depends partly on the opportunities in the domestic Indonesian market. “If the domestic Indonesia is too busy for sure we will have to reduce Thai and Malindo,” Mr Kirana acknowledges. Thai Lion will have its fair share of challenges. While the Thai market could potentially support a third LCC, there will almost certainly be a competitive response from Thai AirAsia and Nok. Both LCCs have the cash to fight back and leverage their first mover advantage. Both have had relatively recent initial public offerings and are highly profitable, with operating margins of 13% at Thai AirAsia and 11% at Nok in 2Q2013. Both LCCs are also planning rapid growth, using the proceeds from their IPOs. Thai AirAsia is in the process of adding eight A320s in 2013 for a total of 35 and plans to add another eight A320s in 2014 as part of a fleet plan which would see the carrier reach 61 A320s at the end of 2017. Nok, which currently operates 16 aircraft with another five small turboprops operated on its behalf by a regional partner, envisions a 30-aircraft fleet by the end of 2015. Thai Lion is only one of three LCCs going through the certification process in Thailand. If also launched, Thai VietJet would result in four short-haul LCCs, which is likely not sustainable over the long term. The other planned start-up, long-haul LCC Thai AirAsia X, does not pose a direct threat to Thai Lion as it will stick to routes of four hours or more. But it will make the overall AirAsia positioning in Thailand stronger as it opens up city pairs from Thailand that the Lion Group in most cases will not be able to provide. Unlike other Southeast Asian capital cities such as Jakarta, Manila and Singapore, Bangkok can support the influx of capacity from an airport infrastructure perspective. Don Mueang, which prior to the opening of Suvarnabhumi was Bangkok’s main airport, has the space to handle an AirAsia/AirAsia X operation matching its Kuala Lumpur operation along with a much bigger Nok and an up to 80-aircraft operation from Thai Lion. Airports of Thailand (AoT) has begun a project to renovate and reopen Don Mueang’s Terminal 2 within the next couple of years, which would give the airport capacity to again handle 27 million passengers per annum. Suvarnabhumi, where congestion last year prompted AoT to incentivise LCCs to move to Don Mueang, is also now finally proceeding with a long-delayed two-phase expansion project to boost annual passenger capacity from 45 million to 60 million and ultimately 75 million. Demand, however could struggle to keep up with the influx in additional seat capacity brought about by the intensifying LCC competition. Thailand is a popular and still growing leisure destination. But it is also a market that has seen big fluctuations in the past, driven by political instability and natural disasters. The Thai aviation market will be one to watch closely as it becomes another battleground in the high stakes chess match between Lion and AirAsia. This is the second in a series of reports on the Lion Air Group strategy. The first report, which was published on 23-Sep-2013, analysed the outlook for new Indonesian full-service subsidiary Batik Air. In the next report, the original Lion Air operation and the emergence of a new hub at a secondary Indonesian city will be analysed.